On the mountain bike in the Peaks again. The Thorny Topic of Tubeless Tyres! OK, so you’ve got your kit and you’re wrapped up just nicely to keep out the elements and maintain the heat you’ll be producing. Let’s hit the roads and get some winter training under our tyres ahead of the 2017 season. Through the village or town is fine but as soon as you hit the country roads, everything is suddenly looking pretty icy. What now? Bail, turn around and go home disappointed? Ride really slowly completing the planned route but on tenterhooks? Not necessarily, often you can have a good ride in bad conditions. It’s a good idea to have an understanding on what the conditions will likely be before you set off, keep an eye on the weather forecast and also think about how the conditions were during the day or the previous evening/night. If it’s been raining recently, the roads are soaking wet and the temperature is due to drop below zero, then yes expect ice and it probably is best to stay in. If the weather has been clear and the roads are bone dry then a drop in temperature although it may bring frost probably won’t involve ice, except in minor patches/puddles and the road edges. So let’s start with Ice, after all that’s the one mentioned in the opening paragraph. Riding on Ice – First up we need to decide if it is really ice. If the road is glistening slightly in the moonlight or you can see white then it’s probably just frost and not ice at all. For a lot of us here in the UK ice will appear in patches and small patches can usually be dealt with. Ice requires water to be laying on the road in order for it to form, so look out for what would ordinarily on a warmer day be potholes, these might be water filled and frozen. However if you’re traveling in a straight line and the ice patch is a couple of feet in length or less then you shouldn’t really have any issues just keep stable, straight and smooth and don’t turn or brake. Also avoid the broken and rutted parts of country lanes; these are usually the edges, It’s more important than ever in bad conditions to not be tempted into the ‘riding in the gutter’, stay central to your side of the road where ever possible, the surface there will be better and it gives you the option of moving to the left or the right as necessary. In really bad conditions when the temperature remains consistently low you may find larger swathes of ice, in these conditions I would just advise against riding your bike unless your bought (and fitted) tyres with spikes. 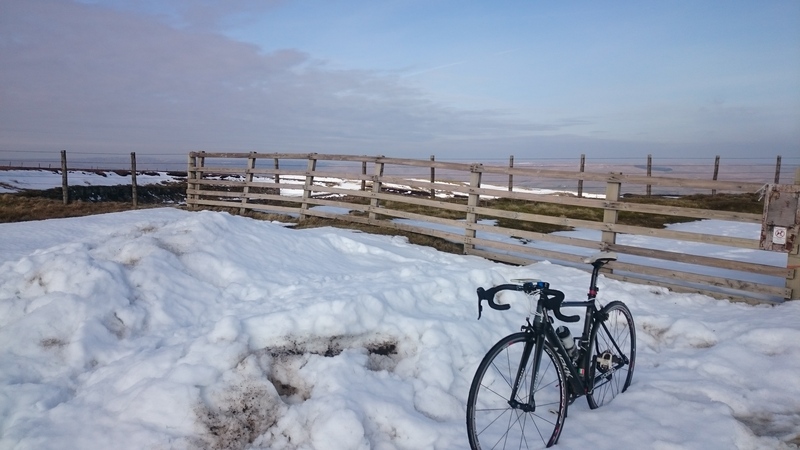 Riding on gritted roads – In summer conditions I’m a big fan of riding little back roads and country lanes where cars tend not to leave their tread. But come winter it’s worth remembering that in the frozen cold conditions these much loved back roads will be left to ice up as they will get no visits from the local council gritting truck. So with this in mind you might rather choose to spend your winter cycling time on more main roads where grit has been spread and the chances of finding ice is much lower. Just make sure to be well lit and visible though, as no amount of grit can prevent the formation of traffic! Riding on frosty and wet roads – The difference between riding on ice and riding on frost is worlds apart. On sheet ice the slightest turn, brake or wobble can leave your tyres gripless and be the beginning of an unscheduled time spent laying on the tarmac. Frost however, has very similar properties to a bike tyre as a wet road. You’ll have less grip than if it were a hot summer’s day but usually you have more grip than you might at first imagine. If you want to confirm this to yourself then when you start off into a frosty section of road, drop your speed down to a slow roll and pull on your rear brake to test if your rear wheel will skid. Usually you need to pull far harder on your brake to lose traction on the rear tyre than you’d expect, even though the frosty conditions suggest otherwise. In general, frost looks more slippery than it is. Keep your riding smooth and controlled – Good advice for all year round riding but particularly important for adverse conditions. The less jerky your riding the better chance you have of keeping your bike the right way up at all times. Slow before bends not through them. Brake with a combination of front and rear brakes when necessary. Accelerate smoothly and pedal with a circular motion rather than one of alternating down strokes. When going round bends keep the inside (left when turning left, right when turning right) pedal high and your weight pushing down through the outer side foot. Stay seen in the dark and gloom – You can of course ride in the dark in the summer and you can also find yourself riding along in winter on a bright clear day. However, we all know that the likelihood of having to ride in the dark and gloom is greater in the winter with the shorter days and and poorer weather. So make sure that you invest in a good set of lights, front and rear and keep them charged up or better still take spare batteries with you. The craze at the moment is to have rechargeable lights with their batteries non-removable which is fine if you keep on top of recharging them but having removable batteries allows you to take spares and even buy spares at a village shop mid-ride if need be. Of course lights aren’t the only way to be seen, take note of who stands out the most when you are driving a car yourself and you’ll soon realise what a difference a reflective top makes. Available as jerseys, jackets and also gillets reflective clothing has come on a long way from the saggy high-viz waistcoats of a few years back! Check out the proviz range on Amazon here. Wider tyres and lower pressures – If possible switching to wider tyres or even switching to a bike that will take wider tyres will help give you more grip in slippery conditions. It will also give you more confidence that you won’t slip and that may help by encouraging you to ride more smoothly. Dropping your tyre pressure a little from what you would run during the summer can also help. If you normally run 100 psi in a 25c tyre then try running 80 instead. Of course you increase the risk of getting punctures doing this with a standard tyre and inner tube setup but it’s a price you might choose to pay. Personally I prefer to ride a tubeless tyre setup instead and this allows me to run the tyres with even less pressure in them without any increase chance of pinch-punctures and no noticeable increase in rolling resistance either. Ride with friends – Always good advice anyway but if you ride with friends then you have someone to assist you in case of an accident but also someone to discuss conditions with. It’s also more fun in the cold to ride with other people, you get someone to moan to about your cold fingers and toes! But sometimes you’ll find that no-one else is quite as mad as you and when you want to ride they’re all tucked up in their nice warm homes and won’t be coaxed out. In this case just make sure that you let someone know that you’re heading out and where you’re planning on going. Also wearing an ID band is a good idea too. Switch to riding off-road – Mountain bikes or cyclocross. Bridleways or trails. If you’re nervous about riding on the road with the winter traffic then consider taking your wheels off-road instead. Of course I ride both on and off-road all year round anyway so I’d advise mountain biking as a great activity to all, any time of the year. 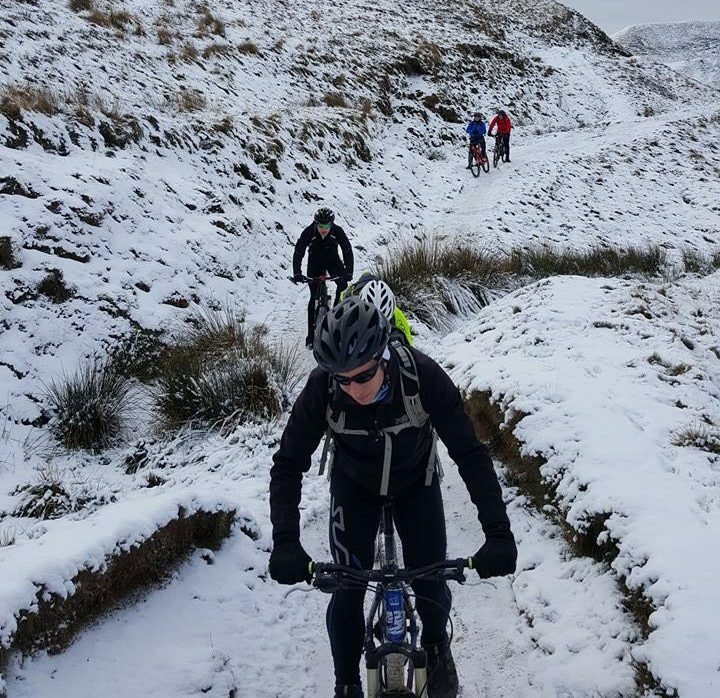 However, mountain biking in snow is awesome fun and a great way to hone your bike handling skills even further. But most of all, don’t let the conditions put you off. 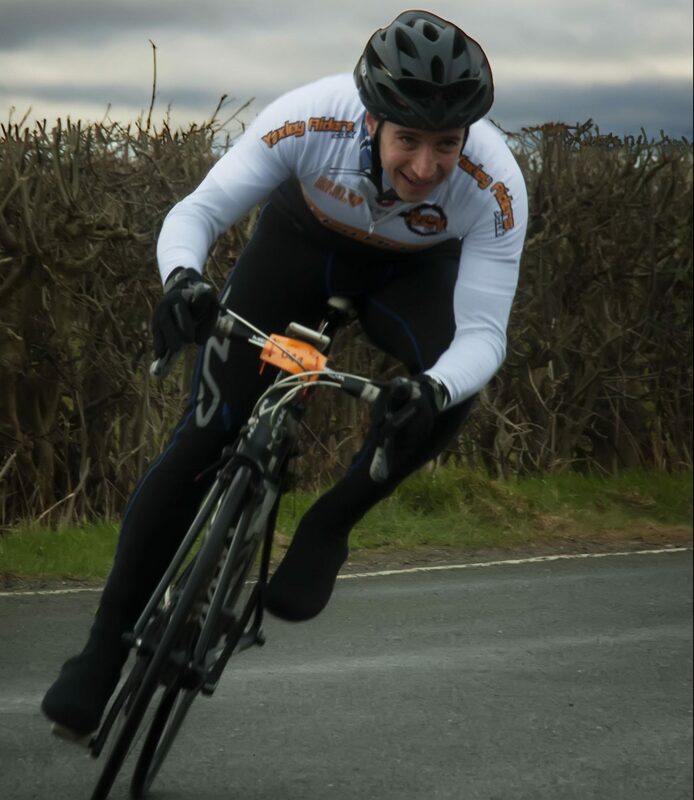 Riding your bike on a cool, clear winter’s evening is a joy and those extra miles will set you up well for your summer season, be that racing or whatever other cycling challenges you may have.